In situations when the CT has a fixed patient table, the Mover helps the CT Dose Profiler to slide through the CT X-ray field at a constant speed. 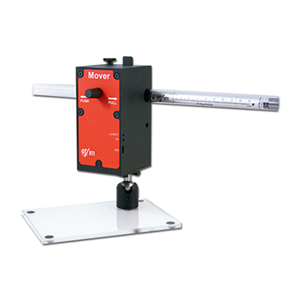 With the Mover from RTI, the full dose profile of any beam width can be measured, both free in air and in a phantom. This is perfect for cone beam CT (CBCT) where it is just as important as for normal CT to know that the width of the beam is correct due to the relatively high dose distribution. The RTI Mover “moves” the RTI CT Dose Profiler through any X-ray field at a constant speed. By moving the CT Dose Profiler through the beam, measurements of Axial scans (and basically any X-ray field) are possible. It creates an accurate and easily reproducible way for CT technicians to measure all interesting dose parameters, geometric efficiency and the true beam width FWHM of basically any scan length. With the CT Dose Profiler it takes less time and applications for the RTI Mover and CT Dose Profiler include: Cone Beam CT, O-Arm, Rotating C-Arms, synergy and OBI. Orientation of the RTI Mover can be performed manually or through software via RTI’s X-ray QA program – Ocean. It can push or pull a dose detector through any X-ray field with a selected speed. Ocean can control both the CT Dose Profiler and the Mover simultaneously, as well as analyzing, saving and auto generating reports.